As I type this, my ears are still ringing like a test for the Emergency Broadcast System. I tried earplugs for about a minute, but they weren't good to my earholes. I ripped them out. I wanted pure funk. Uncut funk. The bomb. 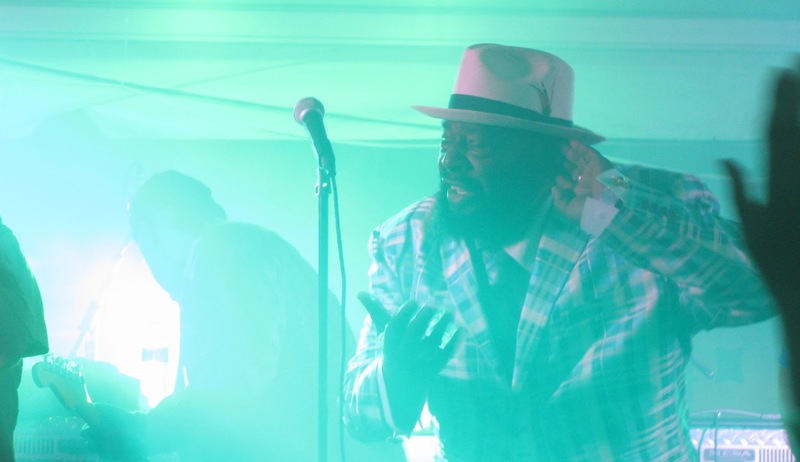 Yesterday, George Clinton brought his Parliament-Funkadelic mob back to Beekman Beer Garden, and they fully embraced their acid rock Funkadelic side. Sure, there were the usual Parliament goodies "Flash Light" and "Give Up the Funk," but last evening, it seemed they were most determined to answer the question, "Who says a funk band can't play rock?" It all started with "Standing on the Verge of Getting It On." Gone are the days of Clinton waiting an hour before taking the stage. He was front and center in seconds, amping up the crowd and tossing in vocal bits of everything from "Pumpin' It Up" to "Dr. Funkenstein" to Chuck Brown's "Bustin' Loose." After a quick spoken word "We Do This," they roared into "Atomic Dog." The heavy bass sent a shockwave through my body and up to the corners of my mouth. A Nick Swardson-looking guy from the crowd jumped onstage and George graciously let him dance. That is, until he had to make room for the girls. The fan retreated over to the backup singers, while George and Sir Nose made a dance sandwich with lady filling. Ricky Rouse stepped forward to rip into a solo, but the partying fans had tripped his cable. He plugged back in and played with his teeth. During "Flash Light," as Sir Nose climbed up the wobbly speaker cabinets, I noticed a look of pure concern on George's face. It quickly turned to relief when Nose made it up safely, contorting his freshly-funked body into an O. They transitioned directly into "(Not Just) Knee Deep," taking a "Sentimental Journey" in its center. The best part of the trip took place as Rouse and Michael Hampton came to the edge of the stage and swirled out complementary solos as the rhythm section dove back into "Knee Deep" behind them. "How y'all doin' out there?" George quizzed the crowd. Applause. "Good 'cause y'all gonna be here all night long." The band started an uncharacteristically chill jam, and Clinton introduced Mary Griffin, who took on Gnarls Barkley's "Crazy." By its end, she was shrieking so loudly it was splitting eardrums, and George reined her in a little by accompanying with his gruff voice. Griffin and Clinton left the stage for... a mid-set "Maggot Brain?" 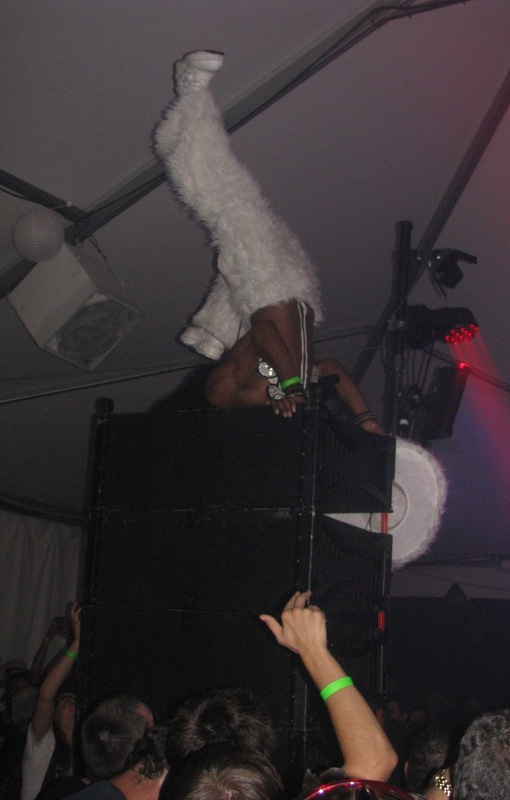 This was a Funkadelic show. After the odyssey, Garrett Shider took the mic and united us on a bluesy "One Nation Under a Groove" that found its way in and out of "Cholly." "Give Up the Funk" ignited the crowd to keep them burning through a "Thumpasorus" medley that delved into quickly into "Up for the Down Stroke" and healthily into Kendra Foster's "Bounce 2 This." George waved goodbye to the sweaty spectators as Funkadelic revved up a fiery "Red Hot Mama." It seemed like that was going to be it. Members had begun packing up their instruments. The crew was giving "finish it up" hand signals. But ain't no party like a P-Funk party 'cause a P-Funk party don't stop. "All aboard the night train!" yelled Michael "Clip" Payne, conducting the remaining musicians onstage, a side project known as the 420 Funk Mob. "Nothing Before Me But Thang" took on a heady liquid groove as Greg Thomas skimmed the surface with his saxophone. Then keyboardist Jerome Rodgers stepped in, his staccato notes injecting a chilliness that turned the jam into the march of an army of ice creatures. Such a gutsy way to end the show. But it wasn't over yet. Michael Hampton didn't want to leave. With a wide smile on his face, he jumped on the mic and started singing "If Anybody Gets Funked Up." He's not a good singer, but he's Kidd Funkadelic. Someone had to join him. As Richie Nagan continued to shake his maracas, Clip took a seat at the kit to finish it out. It was a weird ending to the concert, but a beautiful example of the pure joy a musician can get from performing. 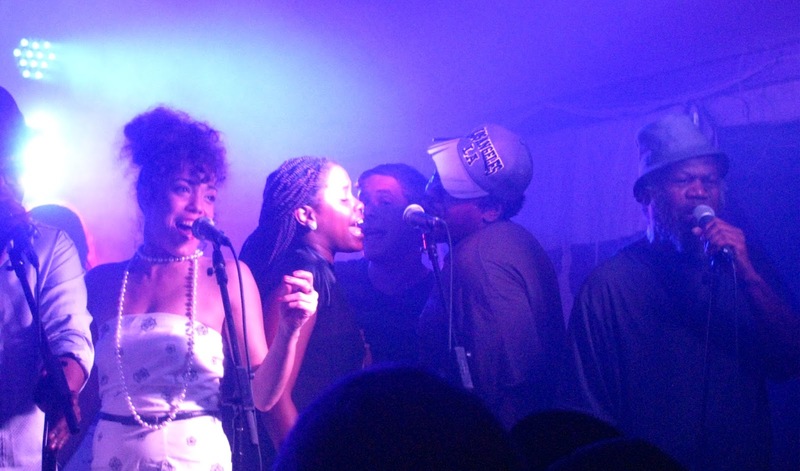 You never know what you're gonna get at a P-Funk show, all the way down to the band itself. As the decades go by, members depart for solo gigs, new ones are accrued, and sadly, some pass away to that funky place in the sky. Though they have a 45-year blueprint, this overturn means the music is constantly evolving, making each concert a truly unique experience. Which is why I'll keep going to P-Funk shows, eardrums be damned.